Stainless steel case with a stainless steel and black ceramic bracelet. Uni-directional rotating bezel. Black dial with silver-tone hands and index hour markers. Minute markers around the outer rim. Dial Type: Analog. Date display at the 3 o'clock position. Quartz movement. Scratch resistant sapphire crystal. Screw down crown. Case size: 35 mm. Round case shape. Deployment clasp. Water resistant at 300 meters / 1000 feet. Functions: date, hour, minute, second. Luxury watch style. Watch label: Swiss Made. 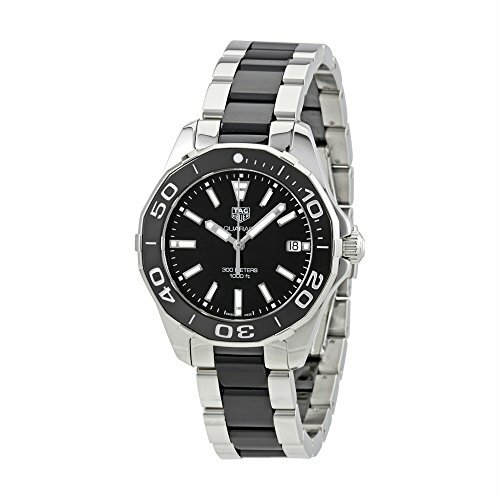 Tag Heuer Aquaracer Black Dial Steel and Ceramic Ladies Watch WAY131A.BA0913. If you have any questions about this product by TAG Heuer, contact us by completing and submitting the form below. If you are looking for a specif part number, please include it with your message.